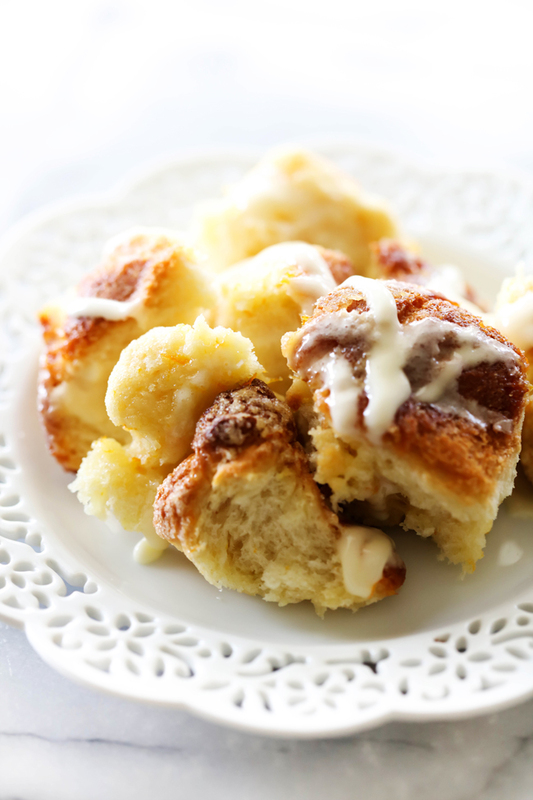 This Orange Creamsicle Pull Apart Bread is completely made from scratch. It tastes like orange rolls in the form of a delicious and fun breakfast or dessert! It has such a refreshing flavor and is the perfect spring or summertime treat! Life has been absolutely CRAZY around here lately. As another school year winds down to a close and summer break is fast approaching, we are feeling the intensity that this time of year brings. Between my kids’ extra ciriculars, this pregnancy, the blog and just life in general, I am finding it difficult to take a breather. That said, I took a wonderful break and went and visited my family this past weekend. I was able to cook with my mom, which is something I always treasure. There is nothing like being in my mom’s kitchen working hand and hand with her. One of my mom’s favorite bread items are orange rolls. In fact, even the smell will ALWAYS remind me of her. I used to hate orange rolls growing up but over time my taste buds matured and now they are a true treat whenever they make an appearance at the dinner table. We decided to transform our beloved orange rolls into a fun new recipe. This was the hit of the weekend! Everyone raved about its delicious and refreshing flavor. I personally love that it is made from scratch. We used to use canned biscuit dough from the grocery store for our pull apart breads, but after being spoiled with a homemade dough, it is almost impossible to go back. It brings SO much more to the recipe. This would be a perfect treat or even breakfast for this time of year. 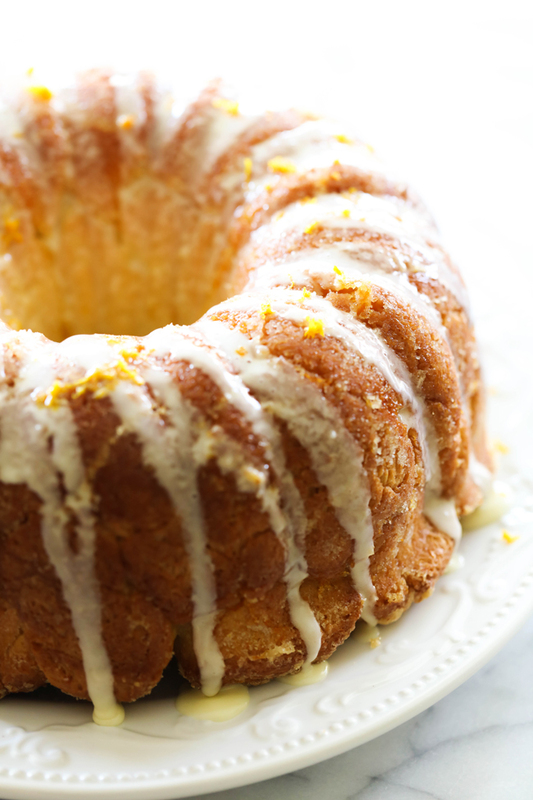 If you wanted to try some different Orange Creamsicle recipes, be sure and check out this Orange Creamsicle Bread, Orange Creamsicle Bundt Cake or my Orange Creamsicle Cookies. They are all fabulous! Stir yeast, warm milk, oil, salt and sugar together and let stand 5 minutes to get the yeast activated. Mix in remaining ingredients and add as much flour as needed for soft dough. I find it easiest to add 4 cups and add an additional ¼ cup at a time until dough reaches a soft consistency. Cover and let rise until dough has doubled in size. Roll dough into 1 inch balls and then dip into the melted butter and then in the orange sugar mixture. Cover with a dish cloth and allow to double in size. Preheat oven to 370 degrees F and bake for about 40 to 50 minutes. Make the glaze while bread is baking. Add all glaze ingredients and mix well. Set aside. Remove from oven and allow to sit for about 3 minutes. Carefully invert pan and place monkey bread onto serving dish. Drizzle glaze over the top and enjoy! I love that this pull-apart bread is made completely from scratch, Nikki! And it looks delish!